Come on down your table’s waiting. The cast of ‘Tartuffe’. Photograph: Jon Bradshaw. Courtesy of Paradigm Theatre Company. For various reasons, Paradigm’s fourth production in their season had many difficulties when it first opened a little over a week ago, including a last minute change of director and some issues with the cast. However it has now finally found its feet. 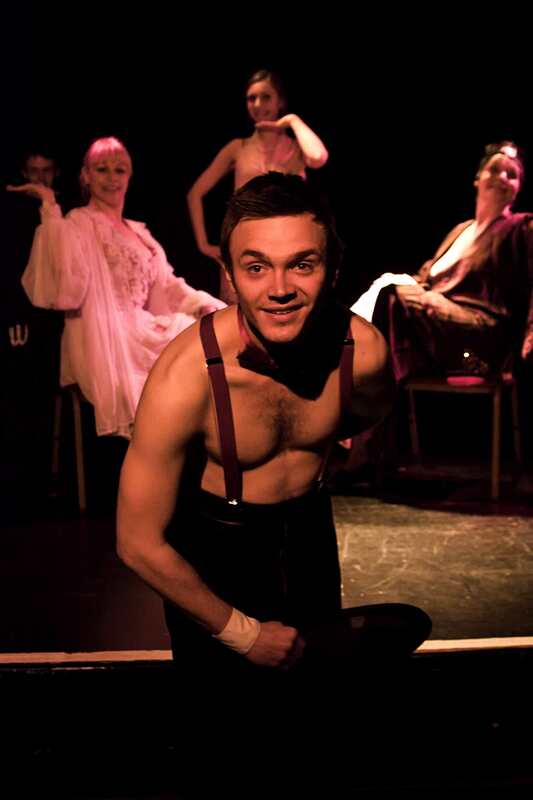 Director and company associate Cat Robey has taken the Gutenberg non-rhyming translation of Molière’s satirical company, reducing it and resetting it in the world of seedy 1920s cabaret. Orgon (Chukwudi Onwere) has been bewitched by a seemingly humble and pious beggar, Tartuffe (Jeremy Gagan). Taking into his home Orgon worships him and lets him have free reign of the household much to the annoyance of everyone but Orgon’s mother. But is Tartuffe all he seems, and is his interest solely in God or in Orgon’s daughter, wife, and wealth? Robey’s truncation of the text down to a mere 90 minutes without an interval is quite welcome. For all that can be said about Molière, as biting as his satire is it is also as verbose in equal measure. It does feel noticeably cut and a touch whistle-stop, but all the main narrative elements are still there and it’s certainly preferred to the prospect of an additional hour of stodgy didactic where every last witticism is extrapolated to exhaustion; Molière is quite fond of his own verse. Even with an energetic cast and Robey’s attempt at make it a bit more pacey the show is still quite flat in places. Despite this the company still somehow manage to make it feel fun. Gagan’s portrayal of the villain is charmingly grandiose and scintillatingly sleazy, making his scheming seem even more dastardly. Whilst Katherine Rodden’s outspoken and saucy chambermaid really brims with energy and sass that drives the scenes she’s in. Robey also manages to direct the more comic moments with ease. Her treatment of unconvincing hiding places for eavesdropping rascals compound upon Molière’s wit to raise a few additional laughs. However the resetting falls by the wayside as it doesn’t lift the text. Despite Shoni Wilkinson’s costumes adding some oh là là it doesn’t really add any gravitas to Molière’s damning portrait of the hypocrisy, class, and religion, and neither does it give a new perspective on the narrative; it just feels superfluous. But fortunately neither does it distract. You can’t blame Robey for attempting to freshen up a writer whose work is notoriously stuffy whilst simultaneously creating a production that reflects the venue. Other faults are mere niggles. There were a few missed opportunities to bring out more comedy in some scenes, and Loyal’s near omnipresence sat in among the audience didn’t seem to make much sense. It’s undoubtedly something Molière purists and enthusiasts should avoid. But by opening up the play to a more general and less severe audience the result is a robust and enjoyable take on a dowdy classic. Tartuffe plays at the Canal Café Theatre, London, W2 6ND until 27 April 2013. Tickets are £12 (concessions available). To book tickets visit www.canalcafetheatre.com. This entry was posted on Sunday, April 21st, 2013 at 18:11	and tagged with Canal Café Theatre, Cat Robey, Chukwudi Onwere, comedy, Katherine Rodden, Molière, Paradigm Theatre Company, play, Tartuffe and posted in Thing What I Saw. You can follow any responses to this entry through the RSS 2.0 feed.